This article was reposted from Schreyer Honors College News (appearing September 27, 2013). It was written by Julia Kern '14, College Relations Intern. 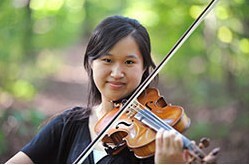 Hannah Lin’s music students have a chance to see their teacher take center stage this weekend. Hannah, a junior in the School of Music and a member of the Schreyer Honors College, gives music lessons to students in the State College community while working toward her degree in music education. She will be stepping into the spotlight as a guest violin soloist with the Pennsylvania Centre Orchestra in a performance on September 29 in Penn State’s Esber Recital Hall. We caught up with Hannah in advance of the show. The group I’m playing with on Sunday is a local professional orchestra, and a lot of Penn State music school faculty play in this orchestra, as well as some pre-professional students. For each gig, the group has a specific number of players they need. For this Sunday’s performance, they actually held a competition for violin students at Penn State, and they selected me and three other graduate students to play. We’ll each get to play one Vivaldi concerto that corresponds to a different season, and I get to play the “Autumn” concerto. I love music, and I love kids, so the major really is a perfect fit. It’s so fun to see kids get excited about music and know that I’m the one who helped plant that seed. I would love to work with middle schoolers because I feel like that’s when they really start forming their own opinions about the world. To take that potential and help guide them through that time in their lives with the help of music would be incredibly special. My mentor and inspiration has always been my orchestra teacher in middle school — it was in his ensemble that I realized I wanted to be an orchestra teacher. He really cared about the students and went out of his way to show that by making jokes and including everyone. Orchestra was a safe place for me, and I felt good about myself there in a way I didn’t in many other classes. That accepting environment where I found so many friends was my own personal haven. I hope I can create the same kind of thing once I become a teacher. I’ve actually had sort of a unique situation growing up and studying music. Because I’m from State College, I started taking lessons from my current teacher when I was a freshman in high school. It was really cool, too, because my sister who is two years younger than me took cello lessons from his wife, so we would both go over to their house for lessons. Since then, I’ve made sure that music stays in our family. I have a brother 10 years younger than me, and I’ve been teaching him viola for a couple of years now. For this upcoming concert, the whole group practiced three times this week as an ensemble, and then it’s straight to the show on Sunday. I don’t really have any special routines before the show, just my routine of getting nervous, going out onto the stage, getting lost in the music, and then feeling a great sense of relief when I’m done. It’s a cycle that I’ve gone through so many times now, although playing a violin concerto with an orchestra will be a new experience for me, so I’ll probably be a bit more nervous than usual. The best part, though, is always after the performance. I love to see the smiles of people in the audience as they react to what I’ve played. I especially love it if little kids come, and I can see that they like what I played. That’s one of the main things that makes it worth it to me.